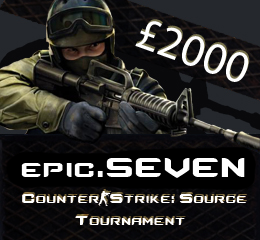 Team signups for the epic.SEVEN Counter-Strike: Source Tournament are now open. epic.LAN is pleased to continue its return to organising professional LAN gaming tournaments after the sucess of epic.SIX which saw Rasta.Xd take victory over Link Gaming. The victors will be returning to defend their 2nd title in a row but will anyone be able to unseat them? With 8 years of experience running LAN events, the team is in a prime position to continue their tournament series at epic.SEVEN in July 2011 at Uttoxeter Racecourse, Staffordshire.